Day 1 on a new job is always an experience. Day 2 is usually harder as that is when reality hits. So that’s something to look forward too! Day 1 started with Paearun & Nick collecting me from the hotel in the SMP tuk-tuk. That’s Paearun and the tuk-tuk below as we waited outside 1 of 3 bank stops on the way to the office. With bank stops I spent the first 2 hours of the day in the back of the tuk-tuk. Paearun is teaching me Khmer – today I learnt hello and thank you. Or I think I did because my pronunciation was awful and at 8:47pm I have forgotten both words. I do know thank you starts with an “argh” sound from the back of the throat. The second part involves the middle of the tongue touching the roof of the mouth. Hello starts with a S and has 2 syllables it’s good I have 10 weeks. The office is about 30 minutes from my hotel and is outside central Phnom Penh. As we left the central area Nick said “we will cross Smelly River soon” and then we are nearly at the office. I asked “what do the locals call Smelly River”. And apparently everyone calls it Smelly River. So we cross our first stretch of water and I ask “was that Smelly River”. It wasn’t. After the third pungent water crossing Nick said “that was smelly river”. Coming home tonight I think I could smell Smelly River or its relatives for about 15 minutes of the 30 minute trip. I don’t honestly know if Smelly River was the worst or not. The rest of the trip all I could smell were fumes. I don’t think going to the office will be my favourite part although it may well be the part I remember most! Luckily I have options and won’t have to spend every day there. The office is a room the size of our lounge room above a warehouse. It fits 4 local staff, Nick and myself. It does have air-con for which I am eternally grateful! The staff cook lunch and will cook for me which is fabulous. Today was rice, fried fish, watermelon and a corn & pumpkin soup. We ate sitting on a big piece of cardboard on the warehouse floor. Below is the warehouse from the outside (on left) and an inside view showing office above the warehouse. Work wise there is lots to do. Lots of competing priorities, wants and no plan. It’s my job to sift through it all and develop a plan. So next few days is all about gaining knowledge, understanding, documenting and preparing a plan. The local staff are very helpful and enthusiastic. What is very apparent is they are very much looking to me to provide advice and implementation within my 10 weeks. So is plenty to do. My hotel is a little oasis. Maybe not the best location but great all the same. 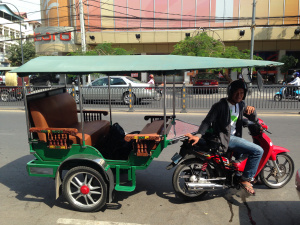 Very few places to walk too to eat so I will have to venture further afield or brave more tuk-tuks. Reality bite from Day 1. My experience will be authentic!